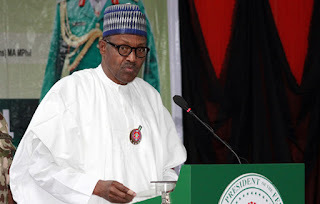 Buhari spoke at the old Banquet Hall, Presidential Villa, Abuja, during the launch of one of his support groups, “Together Nigeria". The President said, ” At this point, I would like to acknowledge the overwhelming support I enjoyed from individuals and organizations across the country over the years. “I say thank you to all those who contributed to our success in one way or the other. The President’s wife, Aisha Buhari; wife of the Vice-President, Mrs Dolapo Osinbajo; Nasarawa State Governor, Tanko Al-Makura; and his colleague from Ogun State, Ibikunle Amosun, attended the event. Also, a former Secretary to the Government of the Federation, Babachir Lawal, and several Nollywood stars witnessed the launch. Speaking at the event, a member of the House of Representatives, Mr Mohammed Kazaure, told the audience that he had yet to see anyone who would defeat Buhari. Describing the President as the “old man”, Kazaure said, “I have not seen anybody that will defeat that old man Buhari.” He also praised Aisha for being frank with her comments on the President’s administration. However, he claimed that if given another four years, Buhari “will do better than he has done".